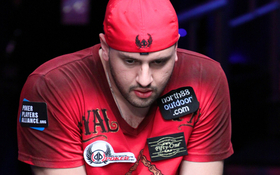 Mike “The Grinder” Mizrachi Started the final table of the 2010 World Series of Poker Main Event with a mere 14 million in chips; good for 7th place out of the nine remaining players, but “The Grinder” was able to steadily increase his stack, first by knocking out Matthew Jarvis, and then by applying pressure to the rest of the table. For much of the final table Mizrachi was the chip-leader and looked to be playing solid poker, until a couple of confrontations with the crafty Joseph Cheong knocked Mizrachi back a bit. With the table down to 6-handed play Mizrachi found himself in a difficult spot against his good friend John Racener who came over the top of Mizrachi’s open-raise with an all-in shove. It appeared that Mizrachi desperately wanted to fold the hand but the odds were simply too good, and he found himself on the bad-side of an AK vs. A8 confrontation. After a paired flop Mizrachi saw some hope of a chopped pot, but a King on the Turn gave Racener the win and left Mizrachi drawing dead. Not long after Racener doubled through Mizrachi, “The Grinder” got all his chips in on a Queen-high flop with Q8, only to see Jonathan Duhamel call with well-hidden a pair of Aces. This ended Michael Mizrachi’s incredible 2010 WSOP which saw him win his first WSOP bracelet in the $50k Players Championship, finish 5th in the Main Event, challenge for the Player of the Year award, and saw him shoot up to 7th place on the all-time tournament money-list. This entry was posted on Monday, November 8th, 2010 at 7:22 am and is filed under Poker News. You can follow any responses to this entry through the RSS 2.0 feed. You can leave a response, or trackback from your own site.